Vice President Mike Pence and his wife Karen recently visited Grove City College where the Vice President delivered the commencement address focusing on the Christian values that have made this nation exceptional. Vice President Pence reinforced his unwavering stance on defending our most vulnerable children during his speech at this extraordinary college where Christian leaders are trained to stand firm in their faith, and the Vice President stated, "I can't tell you how proud I am to be Vice President to a President who stands without apology for the sanctity of life and all the God-given liberties in the Constitution of the United States." Many in our society claim to be supporters of individuals with Down syndrome and talk about inclusion, diversity, tolerance and acceptance while never addressing the unborn holocaust of these awesome children once they receive a diagnosis. Prenatal testing coupled with the instrument of abortion represents the most extreme form of prejudice, profiling, intolerance, exclusion and eugenics, and in some cultures Down syndrome termination is 100%: http://foreverymom.com/family-parenting/thanks-to-screening-and-abortion-no-babies-with-down-syndrome-are-born-in-iceland/ As prenatal tests rapidly advance unlocking more traits our culture labels defective or undesirable, we all need to ask who will be the next victims of this silent genocide? 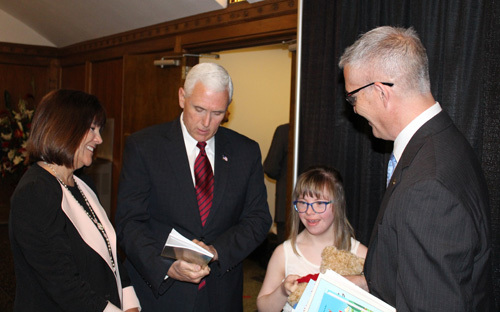 It was an absolute honor and magical moment to meet with Vice President Pence and his wife Karen, and his actions clearly show that he is a true Champion for Down syndrome and the sanctity of our most precious, priceless national treasure – Human Life. 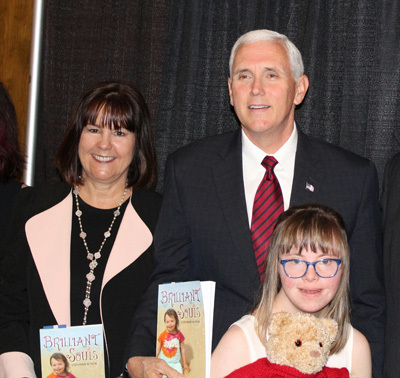 We are very blessed to have the leadership of Vice President Pence for our one nation under God, and I firmly believe his remarkable faith, vision and guidance will end this American holocaust against our most defenseless children and restore the American dream for all people including individuals with Down syndrome from the moment of conception. Without question this is THE ISSUE of our generation, and since 1973 the instrument of abortion has ended the American dream for almost 60 million innocent unborn citizens. How we act or fail to act will shape the soul and future of our nation. I am the father of a beautiful daughter Chloe who was born with Down syndrome, and she is a priceless Blessing to our family and community. When I became aware of the 90+% abortion rate for children diagnosed with Down syndrome in the womb, I embarked on a mission to be a loud Voice for children like Chloe and make sure people see ABILITIES and what a precious gift these individuals are. I speak frequently to policymakers, community groups, students and church leaders about the silent prenatal eugenic movement against children diagnosed prenatally with Down syndrome, and I am passionate about spreading the Truth in a culture that has embraced death, deception and depravity. Jesus Christ is my Savior and Role Model, and I feel very blessed that He uses me as His instrument to defend the most vulnerable members of our society. Never underestimate the power of one small Voice, and "God does not call the qualified, He qualifies the called." As prenatal genetic testing rapidly advances I challenge people to ask the question "Who will be next to be identified, targeted and eliminated because they don't meet the lost cultural mandates for misguided perfection?" Please take time to read my stories, and I would love your feedback. Jeremiah 1:5 "Before I formed you in the womb I knew you, before you were born I set you apart"
Global Down Syndrome story of hope - PLEASE SHARE! 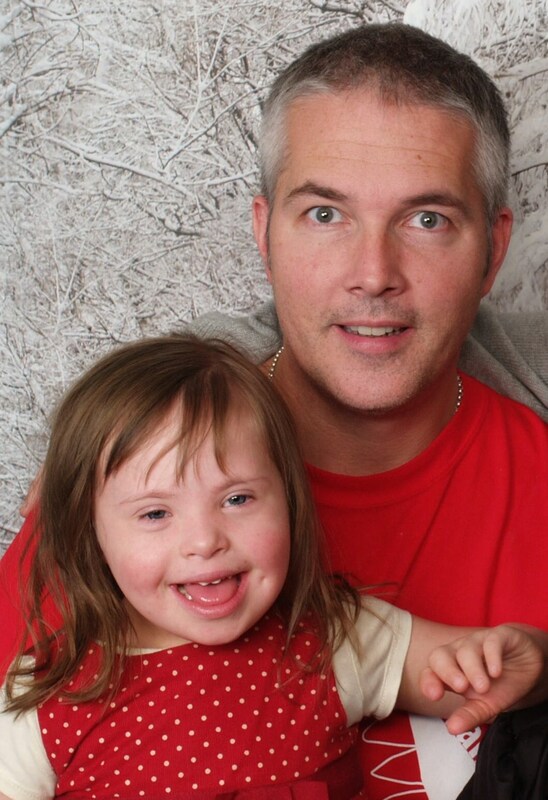 Pennsylvania's Down Syndrome Protection Act - PLEASE SHARE! 'Array of Hope' MUST see video! Priceless Down syndrome LIFE videos – please share!